Goodbye LG G5, hello LG G6. 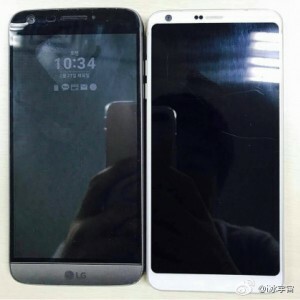 A photo posted to Weibo shows the outgoing flagship next to the one set to replace it. And what a contrast - bezels have shrunk to the point where the G6 is nearly the same size while the screen went up from 5.3” to 5.7”. True, the aspect ratio has changed to 18:9 - the wider aspect ratio to better accommodate the on-screen controls. The resolution is a wider version of QHD, 1,440 x 2,880px. Also, have a gander at the rounded corners of the screen, they were praised by an award-winning designer. An earlier photo showed the back of the phone with dual cameras and a fingerprint reader. The front of the LG G6 will reportedly have an iris scanner. Thanks for sending this in, Zomer! LG G6 battery capacity revealed: "more than 3,200 mAh"
18:9 aspect ratio? isn't that just 2:1? I don't see any decrease in width. It's not really a phone for one handed use if it's not smaller in that department. So.. they cover some of the screen with bezel, and that merits design praise? !